Friday Night Lights fans know when Coach Taylor tells you how to play a game, you do what he says. Except in the just-released trailer for Game Night, the game in question seems legit terrifying. FNL‘s Kyle Chandler plays Brooks, essentially the brains behind the out-of-hand operation, in this story about a friendly neighborhood game night taken up several scary notches. Instead of a cheesy suburban murder mystery party, couple Annie (Rachel McAdams) and Max (Jason Bateman), and the other attendees find themselves thrown into a high-stakes kidnapping/car chasing/hitman-fighting kind of scenario, complete with shady characters and gun fights. Fargo (and fellow Friday Night Lights) alum Jesse Plemons makes a Todd-level creepy cameo (feel us, Breaking Bad fans? ), too. "Over the course of one chaotic night, the friends find themselves increasingly in over their heads as each twist leads to another unexpected turn," the movie's official synopsis reads. "With no rules, no points, and no idea who all the players are, this could turn out to be the most fun they’ve ever had...or game over." We can’t decide if the movie looks terrifying or hilarious, but signs point to maybe both? You’ve got Chandler breaking down the “game” rules only to soon be thrown into a wall by a pack of masked goons, but then you’ve also got Bateman talking up the tastiness of the party cheese and McAdams getting all flustered when a dude who seems to be an assassin compliments her figure. 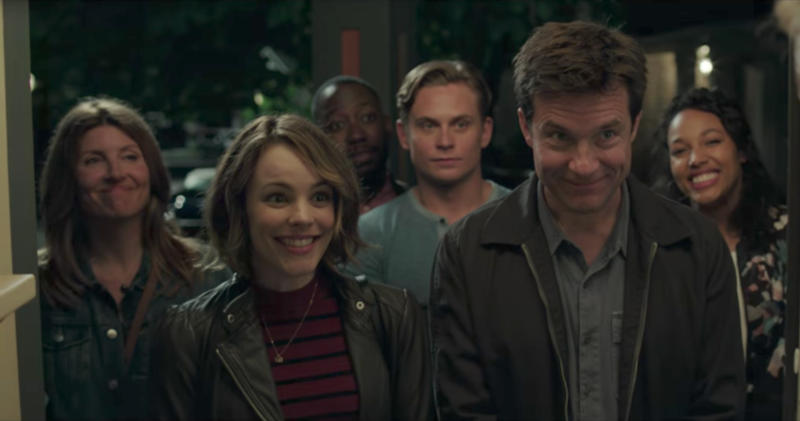 It’s fun seeing McAdams tackle a comedic role, and with the rest of the star power and clever premise promised here, Game Night could have a lot going for it. Game Night comes out March 2nd (aka the perfect time to head back to theaters for a fun, action-comedy palate cleanser after the holiday season’s lineup of dramatic award show contenders and superhero blockbusters).